More than 400 wildfires are burning in British Columbia, Canada, as additional emergency teams pour in from across the country and the US. About 250 firefighters from Ontario, Alberta, and the US state of Washington have been sent to the province to help battle the disaster. Local government officials have confirmed they have surpassed their annual forest firefighting budget. Most of the fires started at the end of July. Finance Minister Colin Hansen said the BC Liberal government had already spent 56.5m Canadian dollars ($55.1m; £34.6m) and counting - passing its allotted budget of $51.7m for the year, according to the Vancouver Sun newspaper. This year's fire budget represents the lowest in more than a decade, the paper says. In 2001, for example, the local government allocated 85.7m Canadian dollars for forest fires in BC. Mr Hansen cited the unpredictability of forest fire seasons for the drop and said the budgets were only projected to cover the minimum cost of getting firefighting resources in place. 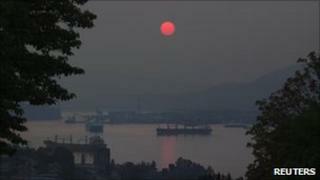 Meanwhile, heavy smoke has enveloped communities around BC. Residents in Alexis Creek, in central BC, began evacuating their homes as winds carried smoke into their community on Friday. But some are refusing to leave. "They are afraid for their homes, and even though the heavy smoke is a serious health issue, they are refusing to leave," said counsellor Sherry Stump. More than 70 of the fires have started within the past three days, according to the Wildfire Management Branch. A water-bomber plane fighting forest fires in British Columbia crashed last week, killing the two pilots and igniting another fire. Emergency teams have responded to 1,272 wildfires in BC since 1 April, which have burned a total of 933 sq km, according to the fire service.